INDIANAPOLIS (September 24, 2013) — Klipsch, a leading global speaker and headphone manufacturer, announces today a strategic partnership with Sun King Brewing to become a name-in-title sponsor of Sun King CANvitational Powered by Klipsch Audio. 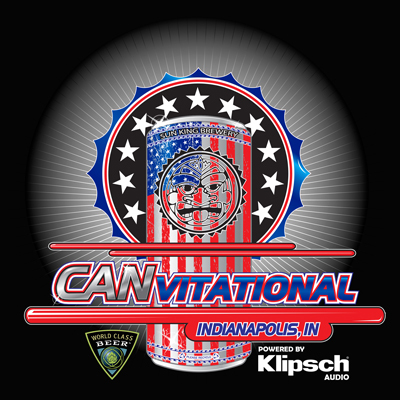 Taking place on September 28 in downtown Indianapolis, the inaugural CANvitational will enlighten patrons to sample craft beer from award-winning breweries located throughout the United States. In addition, attendees will have the opportunity to enjoy local eats provided by food trucks and experience live music from DJ Helicon and DJ Action Jackson in an urban downtown atmosphere. The event is set to take place along Georgia Street, which is known for the Super Bowl XLVI festivities and newly renovated Pan Am Plaza, and will showcase more than 30 craft breweries from around the county who can their brews. As an event partner, Klipsch will be integrated into the day’s events and have brand representatives onsite for product demos. A portion of the event’s sound will also be provided by Klipsch’s high-performance commercial speakers. The brand’s CA-800-T and CA-800-TSW outdoor speakers were recently installed along the popular downtown stretch at the request of Indianapolis Downtown, Inc. and have since played a significant role in transforming Georgia Street into one of the city’s most desirable areas for outdoor events. Today’s announcement builds on the existing relationship between Klipsch and Sun King Brewing that originated from the brands’ shared love for live music. Currently, the two brands sponsor WTTS’ Sun King Studio 92 Powered by Klipsch Audio, the radio station’s live performance studio. In addition, Klipsch is preparing for an install at Sun King’s brewery that will include a speaker studio for live music events as well as custom mobile speaker sets for when the company travels for offsite events. To purchase tickets and learn more about Sun King CANvitational Powered by Klipsch Audio, visit www.canvitational.com. For more information on the Klipsch brand and its product offering, please visit www.klipsch.com. Sun King Brewing Company is the brainchild of Dave Colt and Clay Robinson. With the help of family and friends – Omar Robinson, Andy Fagg and Steve Koers – the first keg of Sun King beer rolled out the door for delivery in July 2009. Now available on tap and in cans at over a thousand locations throughout Indiana, Sun King has grown into the second-largest beer brewer in the state. The company's commitment to handcrafted seasonal and specialty beers has been rewarded with multiple medals at the Indiana Brewers Cup, Great American Beer Festival and World Beer Cup competitions. Visit www.sunkingbrewing.com for more information.